The University of Illinois is moving forward with plans to expand its leadership in the mathematical sciences by constructing a new building west of the Main Quad by 2022 and renovating Altgeld Hall by 2024. Derek Fultz, director of facilities for the College of LAS, said the university is negotiating an architect contract for the roughly $100 million project which is expected to increase capacity, modernize learning spaces, and encourage innovation in data science and other mathematical sciences. Fultz anticipates that the university will sign the contract for the project by spring of this year. “We’d like one architectural team to do both projects,” Fultz said. Campus is still raising money for the project. The new building will be constructed on the site of Illini Hall, which is scheduled to be razed beginning in fall 2020. It will be replaced with a larger, world-class facility for learning and discovery, including a data science center that does not currently exist on campus. The new building will be funded in part with a portion of the $500 million in state capital funding that was approved last spring to launch the Illinois Innovation Network and Discovery Partners Institute. The university will also contribute to the new building. The Altgeld Hall renovation will receive funding from campus in addition to funding from donations and other sources, some of which has already been secured. The building’s inclusion on the National Register of Historic Places means that certain historic features will be restored, while new features will be added to increase energy efficiency and accessibility. State-of-the-art classroom space will be created to improve the learning environment for the thousands of students who take classes in Altgeld Hall each semester. The new building will be an advanced classroom and research facility focused on creating knowledge through mathematics, statistics, data analysis, and machine learning. The departments of Mathematics and Statistics will continue to use space in the new building. The renovation of Altgeld Hall will begin when construction of the new building is complete. 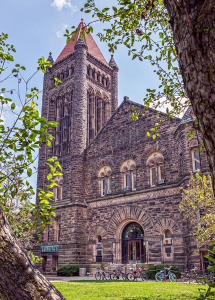 Built in 1897, Altgeld Hall is the second oldest building on campus. It was named for former Illinois Governor John Altgeld and formerly served as the original university library and law school before becoming home to the Department of Mathematics. It was last renovated in 1956.